Hereford cattle have the gene for horns, both bulls and cows. 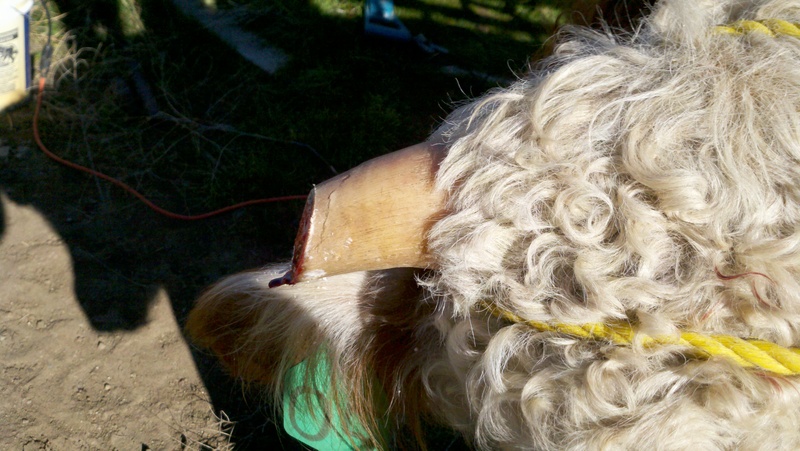 For decades, breeders have used horn nippers in combination with horn weights in order to make the horns curve down, instead of straight out. This is done for several reasons, the primary being for ease of working them in corrals, lead-ups and chutes. The second reason is for animal and human safety. 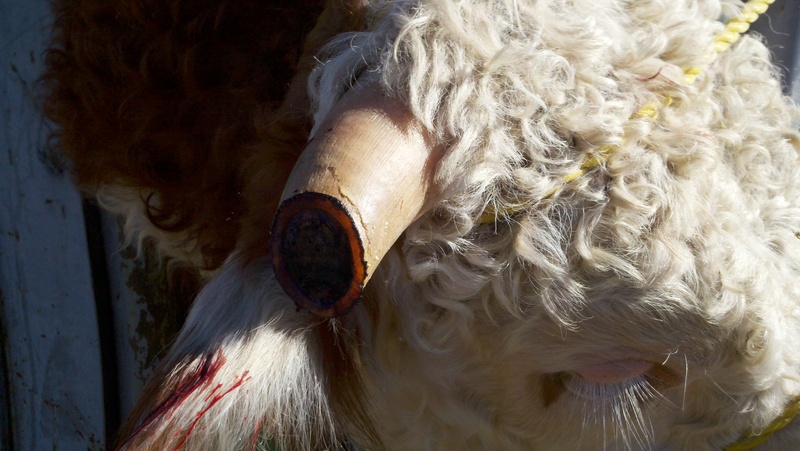 When feeding horned cattle, whose horns are growing straight out, it is rather common for eyes of neighboring cattle to get poked and humans to get stabbed. The downside to using horn weights and horn nippers is that weights fall off, horns will turn at different angles and the horns keep growing. Back in the 90’s I was able to work for the BB Cattle Company, in Connell, Washington and learned a neat trick that eliminated the need for weights and annual nipping. First, there are no nerves in horns. They are similar to finger or toe nails. The one exception is that there are blood veins running out to the tips, which allows essential nutrients to flow; thus allowing the horn to grow. It is best to tip horns when the bulls are between 12 and 14 months of age and also be sure to tip on a day that has low barometric pressure. I have found that there is minimal blood on low pressure days and the ends are quickly seared with the iron. 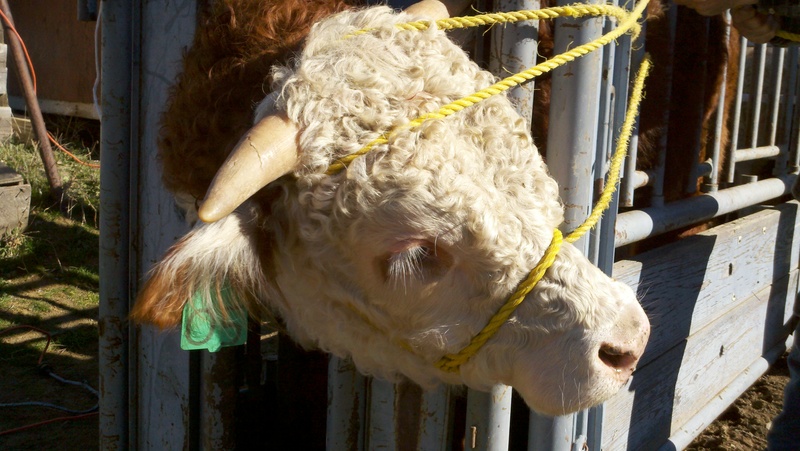 We use a rope halter to hold the head to the side and then bring the end back out and around the horn to be tipped. Note that the rope is placed under the horn at the location of the blood vessel. Proper pressure at the base of the horn stops the flow of blood out to the horn. 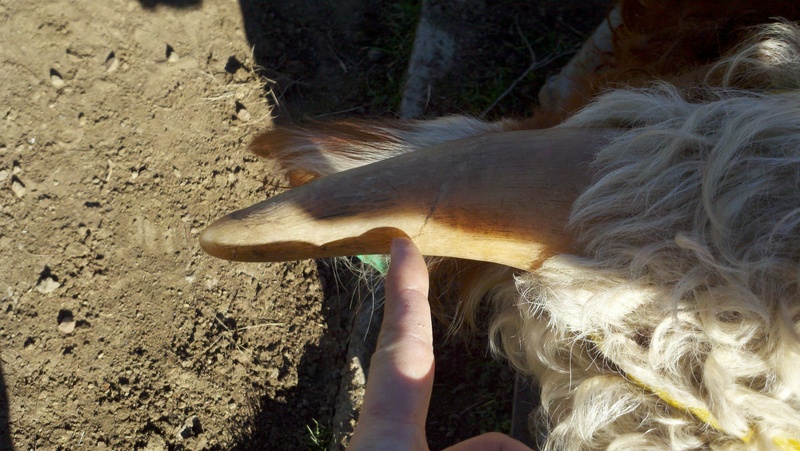 In the picture above, my finger in pointing to the growth mark of the horn. This is the location where I start with the reciprocating saw. After an initial cut straight down, approximately 1/16″, I then continue at a 45 degree angle. In the picture to the left, you can see what the horn looks like after cutting at a 45 degree angle. I then use a horn iron to sear the end. Notice there are only a few drops of blood on the ear. The pressure from the rope and the low barometric pressure are critical. After tipping the left side, we then turn the head the other way, repeating the method of tying and tip the other horn. The entire process takes approximately 3 minutes. Back when we used horn weights, it would take 4 to 5 minutes, not counting repeated trips to replace missing weights, remove weights and annual tipping. The picture below shows what the horns look like at completion. The picture below shows what tipped horns look like on a bull that is 5 years old and have not been touched. I apologize for not being able to provide a video. However, the wind was blowing so hard today that the sound would have been distracting. Perhaps when the spring bulls are tipped I will be able to video. This is a great tutorial. My procedure varies just a bit, but we end up with the same results: a horn that can’t hurt people or other animals all done with minimal stress. Thanks for sharing this. I have being born and bred in a Polled Hereford operation I have never been exposed to horn tipping. This is a great tutorial. 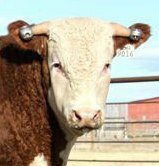 What’s the benefit of raising horned Herefords (or any horned breed) over non-horned/ polled breeds? Thanks Jeff. We started in the Horned Hereford business for two major reasons: more moderate frame size and at the time they were better for maternal traits, specifically milking ability. The Polled Hereford industry had followed the show ring and gone “big” without keeping milk and feed efficiency in perspective. As a side note, I personally feel this is why, as a breed organization, they faced financial struggles and were accepted into the Hereford Association in the 90’s. There were also some major issues with some polled breeders using Simmental genetics to gain size and the polled bloodlines were polluted. Granted, the horned cattle “enjoyed” their own scandal with Prime Time, but quickly identified all offspring with an “x” in the registration number to eliminate those cattle with the polluted genetics. 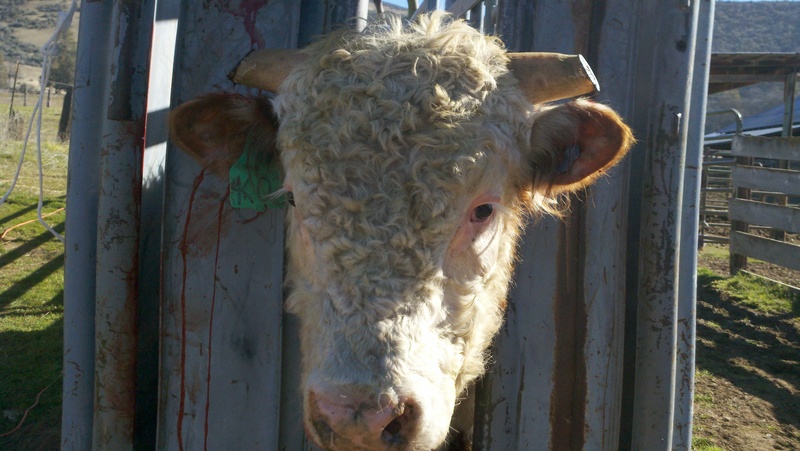 A third reason for us choosing Horned Herefords over Polled, was temperment. At the time, my uncle was raising Polled Herefords and the temperment of his cattle were far from desirable. That is a great explination of the procedure can nerve block them if desired but I do like the idea of the angle that is great idea. Thanks for the info. Before electricity at the chute, we used irons in a fire. It is important to have a hot flat surface to cauterize the blood vessels. Take a branding iron handle and weld on a piece of 2 3/8″ mild steel post cap. This ends up making a cup that will fit over the horn end. If you have electricity a reciprocating saw can be used to tip the horn. Then apply this searing cap to the horn end. You get a more even distribution of heat than with a flat iron. We keep flat irons ready just in case to finish up. While you are at it remember to horn brand your ID #. Horns’ don’t get lost like tags do. We do our work when the sign of the moon is in the feet. Our fathers Horned breeders since the 1940’s felt that if you took it off the head you took it off the rear. Meaning they horned cattle had more depth and width through the rump. We use a recip saw and an electric horn branding iron for caudering. I like your idea of using the pipe…a bit large for the size of the horns when we tip, but could be welded to an electric iron for the same effect. Well, read the posts and information, decided to give it a try. Recently bought some cows with wild horns and they were using there horns to stab and fight the rest of the heard. With no electricity close, I used a regular trim wood saw with no trouble. Poured some of the “blood stop” the sell at feed stores on the cut area, no or little help! Now what to do? blood dripping from the cut and a few bewildered boys standing around yelling dada look! Fortunately I had some sterile gauze in the truck from when I had a tooth pulled and there is always a role of ducktape somewhere in a pickup! A patch of gauze securely taped on with duck tape, bleedy subsided to only a few drops and after the cow was let out of the shoot and headcatch – stopped. Well, the cow looked kind of silly for a few weeks with the silver duck tape on her horns but it eventually wore off. The ends have healed up very nice, will be interesting to see how the horns grow in future. Following the healing of the 1st cow, we have done several more cows, now using regular cloth tape, all the horns have been healing without complications and the cattle are fine. I did do all the cutting on colder winter days when the flies etc were almost non existient here in Georgia. Thanks for all the information, I might try the hot iron trick one day but for now on a cold winter day, gauze and good old duct tape works the fine! Sorry to hear your experience. You need to have a hot iron handy, either electric or wood, especially with horns, as there is no skin for the blood to form clots more easily. Two other bits of information: 1) if you have a “bleeder,” you can put a piece of wire or twine completely around the base of both horns (between the top of the head and the base of the horns) and tighten it. This will constrict the blood vessel that supplies blood to the horns and allow clotting to happen more quickly. 2) We’ve found that tipping on hot and cold days are not good choices…rather warm days. Simply placing a piece of gauze big enough to cover the area, then taping it in place, works good so far. Have the gauze and tape ready, cut the horn, wipe clean, stick gauze over cut end and take along horn, then wrap tape around horn and cut end, squize tape shut over open end. Done.